For the first time in 35 years I’ve decided to make myself a sweater. In my mind’s eye I know exactly how it will look at the end, but sadly the reality is not quite the vision. 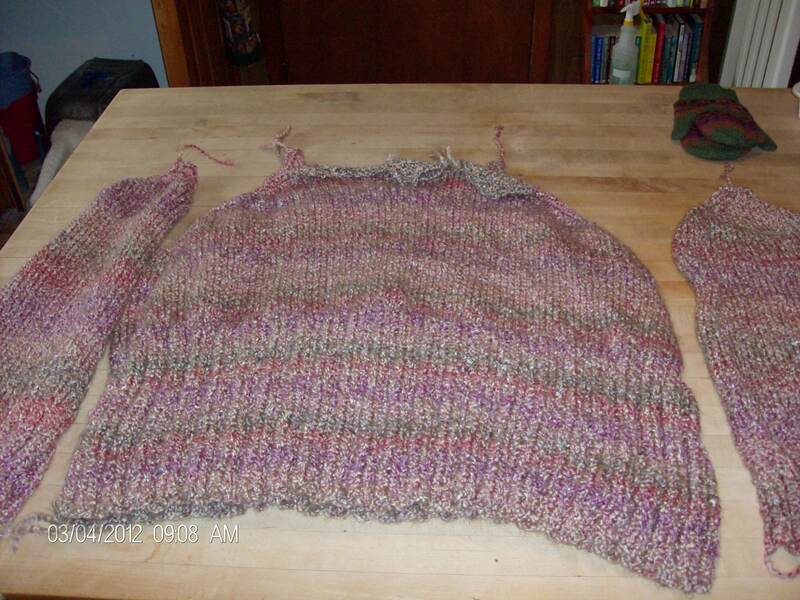 I’m making a sweater in Lion’s Brand Homespun Quartz in a pattern named Banff. It’s a lovely bulky oversized turtleneck sweater perfect for walks, gardening, or work. I’m longing to knit while wearing it. I chose the Homespun because if I do snag it at work then I will have a better chance at a tidy repair and it’s machine wash and dry. Plus I loved the colors in the Quartz yarn. The front and back worked up like a charm – a simple straightforward pattern that allowed for TV time and sweater time to overlap. I was thrilled. Then came the sleeves. I’m making this sweater in a 1X because I am a substantial woman. I like my sweaters, especially the sleeves, long and comfy. I began knitting the first sleeve and was a bit concerned over the cast on of 66 stitches. That is a large sleeve. I worked about 30 rows of the pattern and decided that I wanted to make the sleeves narrower because I just know that I will spend all of my time dragging them through my coffee or soup and catching them on anything available. I frogged them and restarted with 44 stitches. This felt right. Loose, but not bat wings. They worked up fairly quickly, especially when I heard our weather forecast for the beginning of this week…low 30’s as a high. Cool! If I finish it I can wear it comfortably this year! This morning I began crocheting the front and back pieces together. The seams worked up nicely and neatly. Again I was thrilled…right up until the little dim bulb in my brain made the connection between the number of stitches in the sleeves with the armholes. Ack!!!. I put it all in the bag and pondered it for a bit. I worked on a scarf for a friend. I did dishes. I know myself well enough to know that if I put the bag with the sweater pieces upstairs it would languish there for a year or two until I decided to make it into a shawl or wrap. This was not going to happen with the first sweater I was making for myself. I got my crochet hook and a smaller circular needle out. 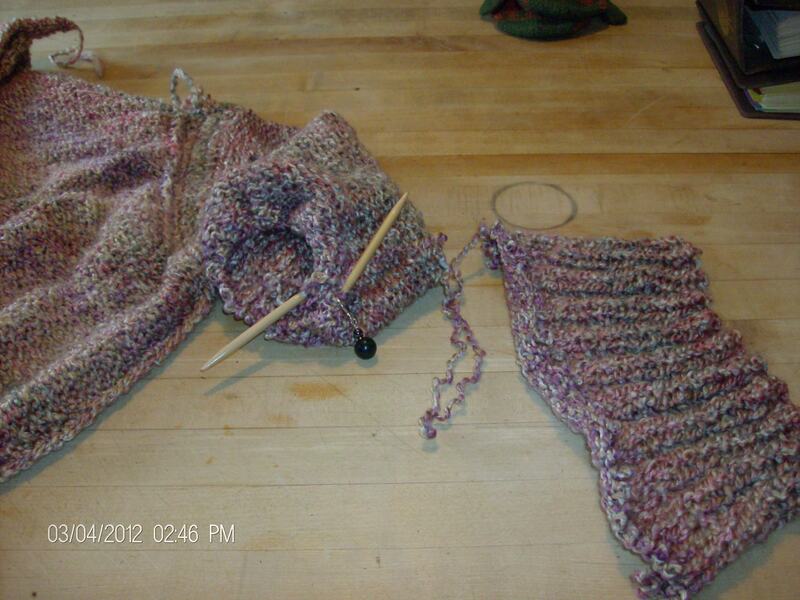 I crocheted a couple of rows around the armhole for shaping and began knitting a sleeve down from the top. I’m not sure how this will work out, but I have faith. Even if I have to tear this sleeve out and start it again, I will finish this sweater and be able to wear it sometime in the next month. There will be more chilly days in this New England season! Have you ever “modified” a pattern out of necessity? I LOVE the color 🙂 It looks so warm & cozy. There’s no doubt in my mind that you will figure it out and be modeling it in no time.